We all have a color that we swear we don’t look good it. A color that you don’t even own or have in your closet. You know, it’s the color that washes your skin tone out or brings out colors in your face that you don’t want to be noticeable. For me that color is yellow. I love the actual color yellow, I think it’s bright, happy, and reminds me of spring. But, when it comes down to actually wearing the color on my body, I cringe. I’m partially scared of the color because I don’t know what it matches with or what I would even wear with it to make a cute outfit. 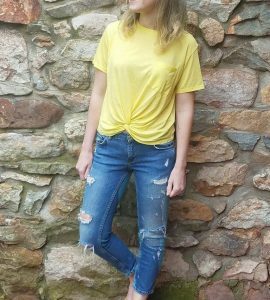 This week I challenged myself to go buy a yellow shirt, and I did find a really cute and inexpensive yellow tee from my local Nordstrom Rack. It’s an ABOUND tee that has an adorable front tie in the middle. It’s a very bright yellow, not like mustard or sunflower…but more like highlighter yellow. When I was trying to think of what I would wear it with I was literally stumped and had to turn to Pinterest to help me. My own struggle made me wonder if others had the same problem with yellow. 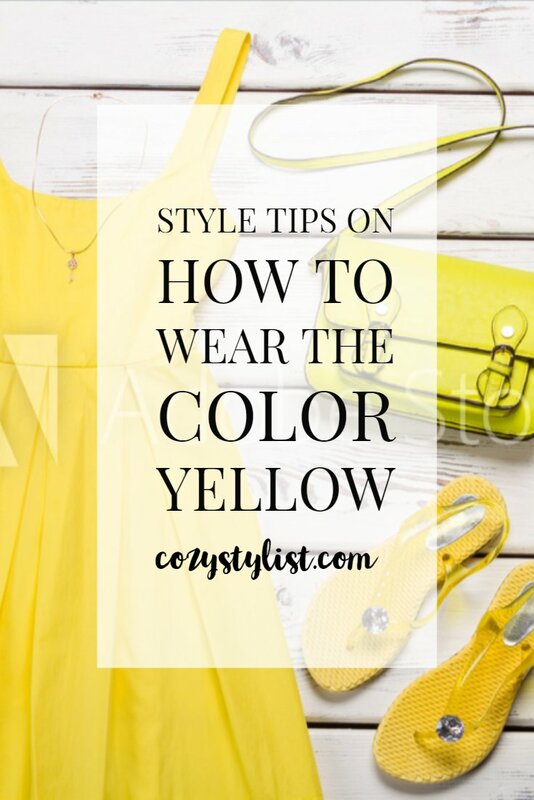 So I researched and found a few helpful tips on how to style and actually put together a cute outfit using yellow. Now the trick to wearing yellow or really any color is to find the right shade of that color to go along with your skin tone. If you have a light to fair skin tone like me mustards and dark yellows will compliment your skin best. For medium to olive shade skin tones, bright and vibrant yellow’s will make your skin glow. And if you have a very dark skin tone you are lucky because mostly all shades of yellow are going to look amazing on you. While I was doing my research I found that if you have red hair with a porcelain skin complexion and bright blue eyes, you can easily wear yellow because it will bring out all your best features. The great thing about the color yellow is that it does actually pair easily with other colors. Since it is a primary color, it matches well with other primary colors such as red and blue. Yellow also works well with secondary colors like orange, green, and purple. (mini art lesson here) The contrasting colors will create a stunning and bold color blocking outfit that will make you look fashionable and stylish. If the solid color yellow is too bold for you try buying the color in a print. Wearing the color in the form of stripes, polka dots, or a floral print will lessen the amount of yellow so that it isn’t overpowering. You can also minimize the effect of the yellow by combining a yellow top with neutral colors. Soft blues like a chambray top or light wash jeans will tone down the yellow and give your outfit an overall soft. 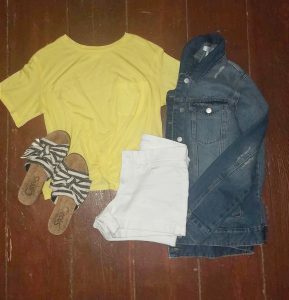 Pairing other pastel color and white with the yellow will also give you a cute and relaxed look that has an easy-going feel. If you aren’t fully convinced that wearing yellow will look good on you there is another very simple way to add the color to your wardrobe. Wear it as an accessory! Simply by adding a yellow scarf, bag, necklace, or pair of shoes to your outfit, will brighten up your look. For example, you can pair a yellow scarf with a neutral black and white outfit or have a yellow bag worn across a pastel colored dress. If you are going for something even less bold, try wearing yellow earrings! They will instantly bring attention to your face and people will definitely take notice! If after reading this post you are still convinced that you look horrible in yellow, my advice would be to just go buy a thin yellow scarf to keep in the back of your closet for when you are feeling adventurous. Wear it with a cute striped blue and white top or a fun sundress. It’s good to try a new color every now and again. If you still don’t like it, well at least you tried. If you want to read more about wearing pastel color this spring, read this post! Thanks so much for reading! You’ll have to let me know if my styling tips worked for you! I absolutely love Mustard clothes at the minute! I’ve been loving them since last Autumn and I’m so glad the shops seem to have loads of Mustard summer clothes in! Love this post as I always struggle with styling bright colours just going for a plain black pair of jeans because they go with everything right? This has given me some better ideas! Thanks for sharing! So glad you enjoyed my post! And yes pairing bright colors with any neutral colored jeans like black or white will work! Yeah girl, just try on different shades of yellow. The brighter tones tend to wash out skin tones. Try a mustard or deeper yellow color. I’m so glad you liked my post! Let me know if you do end up trying on different kinds of yellow! I never knew yellow was for me until last winter when I tried on a yellow coat and fell in love with it. The problem was that I never wore yellow before, just thought it wasn’t for me. I am sold now! Great article! You should definitely try it girl. I never wore yellow either but I found that it can be such a fun color to wear! blog and wished to say that I have really loved surfing around your blog posts. Yay, let me know how your outfits turn out! Yellow can be so hard to wear – some shades are just wrong on me for sure! I love bright colours so have a few pieces but I started with a pair of leggings with bananas on and it went from there 😀 Yellow accessories are a good place to start also! I actually love wearing yellow (I have a fancy yellow jumpsuit with flowers on it that I wore to a wedding!) but this post was so well written that I felt like I learned something anyway. I tend to like lots of bright colours, so I definitely want to try monochrome plus yellow at some point!! Yellow Is my favourite colour to wear!